When the last glacial period ended about 11,500 years ago, the Earth's modern climate began to develop. The large continental ice sheets shrank, and sea level rose. Around 8,200 years ago, however, a major cooling event occurred. The 8.2 ka event was first discovered in the Greenland ice core GISP2. Over two decades temperature cooled about 3.3°C in Greenland. Temperatures in Europe dropped by around 2°C. The entire event lasted about 150 years. Then temperatures warmed, returning to their previous levels. So what caused the 8.2 ka event? As the large ice sheets in Canada were melting, a large meltwater lake formed south of the Hudson Bay. Geologists have named this Lake Agassiz, after the 19th century scientist Louis Agassiz. 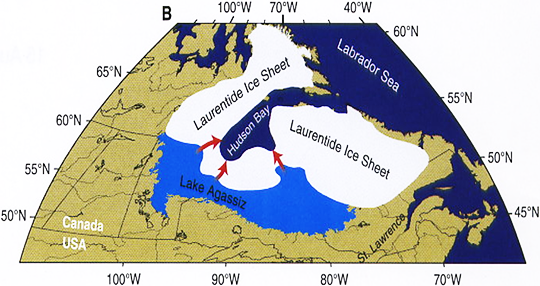 It was dammed to the north by the Laurentide ice sheet. Slowly, the ice melted further, and the lake emptied into the sea in a very short period of time. The release of the water from this ice-dammed lake into the ocean is recorded by sea-level jumps in the Mississippi and Rhine-Meuse deltas of approximately 0.4 and 2.1 metres. The cold water flooding into the Atlantic caused cooling, and the rising sea level formed the North Sea and the English Channel, creating the familiar shape of Britain. This event shows that the climate can react strongly to sudden changes. Kicking the climate systems is likely to have significant consequences.